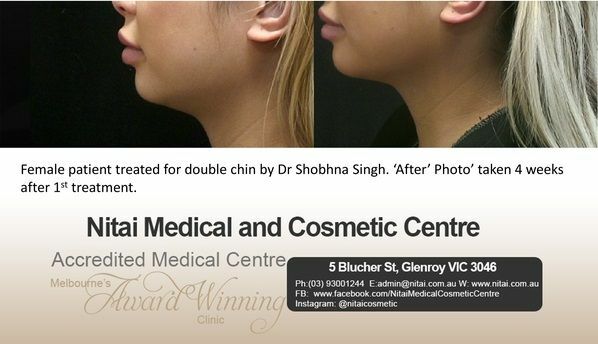 Permanent Double Chin treatment is now available in Australia. Unfortunately, due to Australian regulations we cannot mention the name of the product here. The treatment is designed to improve the appearance of the chin by dissolving the fat in the area. ‘Double Chin’, is a common issue most men and women face as they age. The double chin issue occurs due to a number of factors such as change in weight, ageing and genetics. Until recently lipo-suction treatments have been the main option available in Australia , however the cost of these treatments has been very high and out of reach of many. Side effects have also been a deterrent. 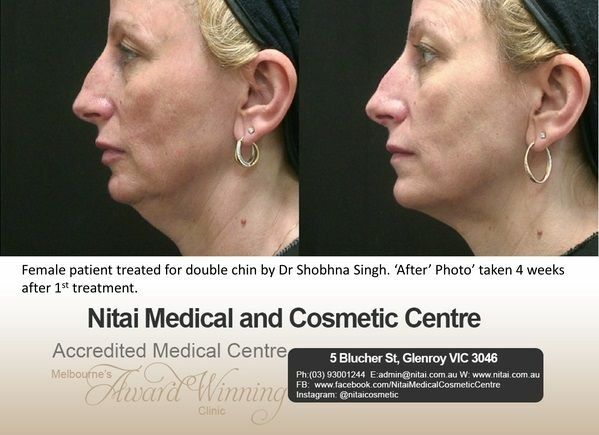 With the introduction of new Permanent Double Chin treatment, it is now possible for many average Australians to access this treatment. The treatment is not new. It has been used in USA and many overseas countries for a few years. 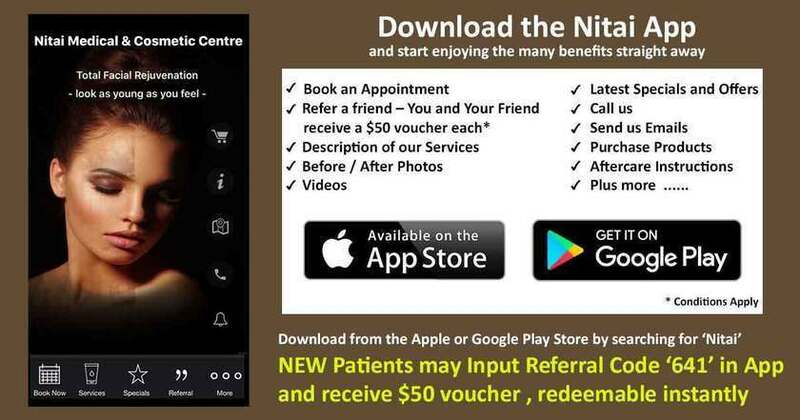 At Nitai, our doctor, Dr. Shobhna Singh , has been trained by Global experts in this area. She is now offering free and no-obligation Double Chin treatment consultations. Following a detailed consultation, treatments may be booked. How Does Permanent Double Chin treatment Work? In our body, the presence of deoxycholic acid, helps in the absorption and breakdown of dietary fat. 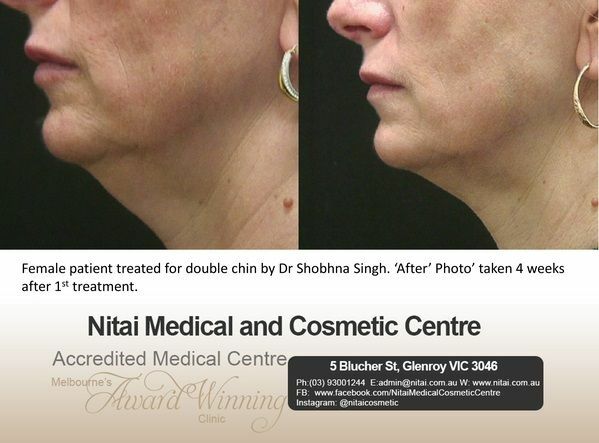 Deoxycholic Acid in a synthesised form, is an active ingredient in treatment of double chin. Fat deposits in the chin, referred to as ‘double chin’ can be reduced with the injections by breaking down the fat cells. The fat is then absorbed by the body. As a result, visible improvement in the chin profile can be achieved. Recent studies have shown that more than 75% of patients reported High satisfaction with their contoured chin profile using the Double Chin treatment. How Can Double-chin Treatments Help With Self-perceptions? Studies have shown that following a double-chin treatment, patients have reported feeling happier and younger, less embarrassed, less bothered and less self-conscious. 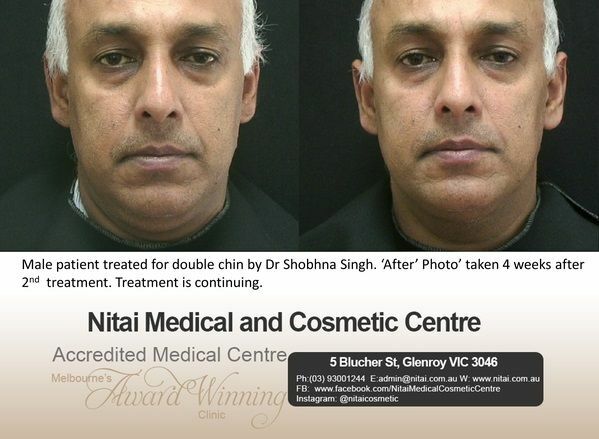 Double Chin treatment treatments are customised for each patient to suit one’s anatomy and circumstances. Upto 6 treatments, generally 6 weeks apart may be given. It is likely that visible results will be noticeable in 2 to 4 treatments. The Double Chin treatment treatment works by destroying fat cells in the chin. Once destroyed, these cells will not return. As a result, the treatment is permanent. Please note that multiple treatments are necessary to achieve the desired result. Who Can Administer the Double Chin Treatment? As the Double Chin treatment uses a Prescription only medicine, treatment should only be administered under the strict direction of trained Medical doctor. At Nitai, your safety is paramount so we take this matter very seriously. 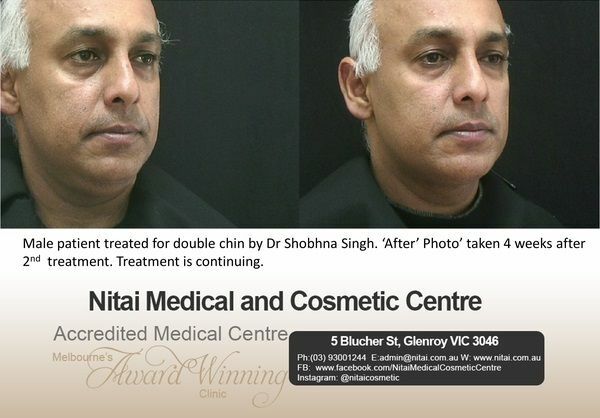 At Nitai, double chin treatment will only be administered by a trained and very experienced doctor. We do not delegate your safety to a nurse. 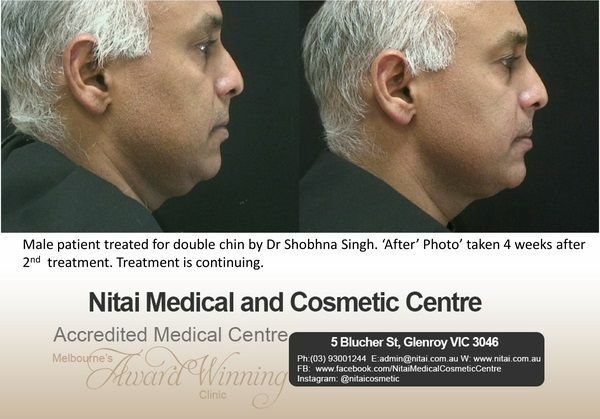 As the Double Chin treatment has only been launched in Australia, only a small number of local Before/After images are available.The following images are of of patients treated by Dr Shobhna Singh. The following images have been supplied by Allergan, the local supplier of the product used in the treatment, to give us an idea of what is achievable. What Is Most Common Side Effect of the Double Chin treatments? You can expect to experience swelling as a result of the treatment. In fact swelling is a sign that the treatment is working. If there is NO swelling, please contact our doctor. Swelling can typically last 2-3 days with the most severe in the first 24 hours. Other side effects can include bruising, , pain, numbness, redness, and formation of small areas of firmness. You may use ice/cold packs and /or oral analgesics to manage side effects as needed. We do recommend patients to take the day off work following the treatment.